The following specifications and diagram came from Mike Keers. It is clear that Sparkman & Stephens designed the Columbia 29 in 1962. The basis for this is a Glas Laminates brochure of the Columbia 29 showing "BOAT #1 during test evaluations on the gusty San Francisco Bay". 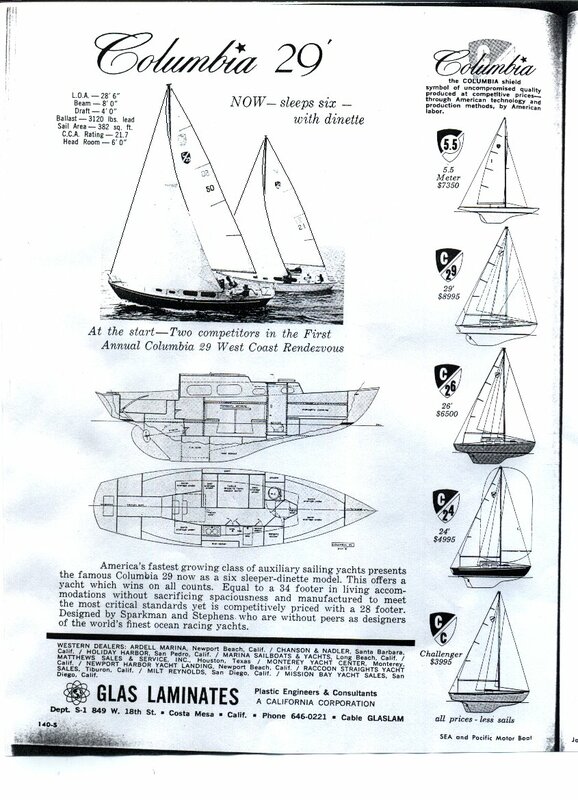 The model was so well received that the company, Glas Laminates, decided to sell all their boats under the Columbia name, thus Columbia Sailing Yachts was born. Click here to see an early ad for the Columbia 29. It appears that there isn't much difference between the original Columbia 29 and the Columbia 29 MkII. 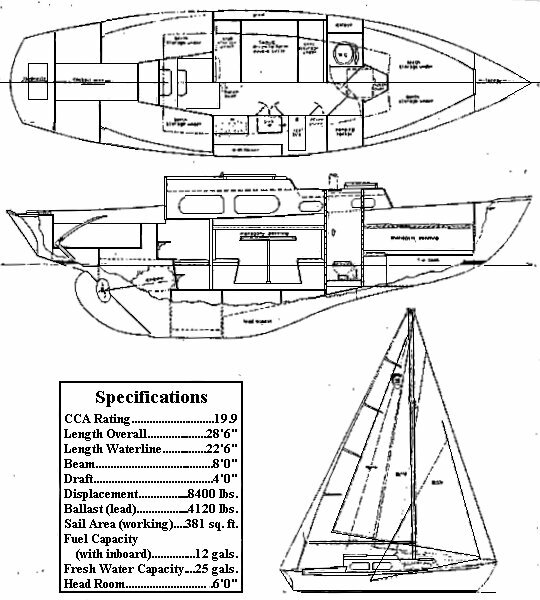 In the April 1967 issue of Skipper Naval Architect Robert G. Henry, Jr. states that A new version of the Columbia 29 has recently been introduced by Columbia Yachts so that gives a pretty good date for its introduction. 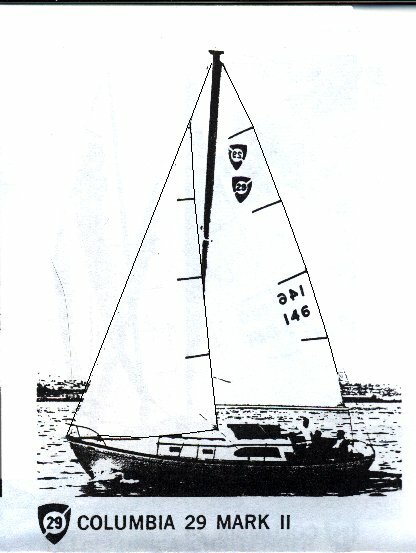 According to a Columbia 29 MkII brochure, The new version of the Columbia 29, the Mark II has the same hull, rig and sail plan as her illustrious Sparkman & Stephens designed predecessor and the same winning ways. What distinguishes new from old on the outside is the Mark II's streamlined new deck styling. With this change, the 29-footer now shares the "Columbia look" with the Columbia 40, Columbia 31 and Columbia Sabre. One special feature of the Columbia 29 Mark II is the one-piece fiberglass headliner. The cabin trunk and the "inner shell" are made in separate molds, then put together with a reinforcing core material between them. Displacement early 7400, late and MkII 8400 lbs. Ballast (lead) early 3120, late and MkII 4100/4120 lbs. Fuel Capacity (with inboard) 12 gal. Fresh Water Capacity 35 gal. Sail Area 382 sq. ft.
An early brochure and ads from Sept '62 Feb '63 have the ballast as 3120# and displacement as 7400#. A 29 MkII brochure, ads from Feb '66 and Jan '67, and an article from April '67 have the ballast as 4100# and the displacement as 8400#. 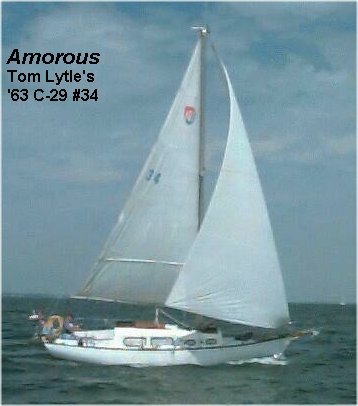 Amorous, Tom Lytle's '63 C-29, hull #32. Click on image to see full size. As noted, the C-29 MkII was a cosmetic update of the original model. The most obvious difference is the single long, narrow port on the main cabin instead of the two more square ports on the original. Click here to see a C-29 MkII. The big, boxy cabin looks a bit dated today, especially when compared to the raised deck Defender 29 and Challenger 24, and the sleeker Contender 24 - all contemporaries. But based on John Dunsmoor's C-26 testamonial and my experience with my C-24, these are sweet sailing vessels that you can put your faith in. They do Sparkman & Stephens proud.